Hi, I'm new to these forums. About six months ago I purchased an '87 Fifth Avenue. After some quick service to adjust the choke and reconnect the wire to the heater switch, she's running fantastic now. My problem arose when I blew my first tire recently. I managed to get it to a garage, but quickly found that I'm missing the key wrench to remove the hubcaps. This resulted in that garage insisting on cutting the hubcap off. I few days ago I blew another tire. 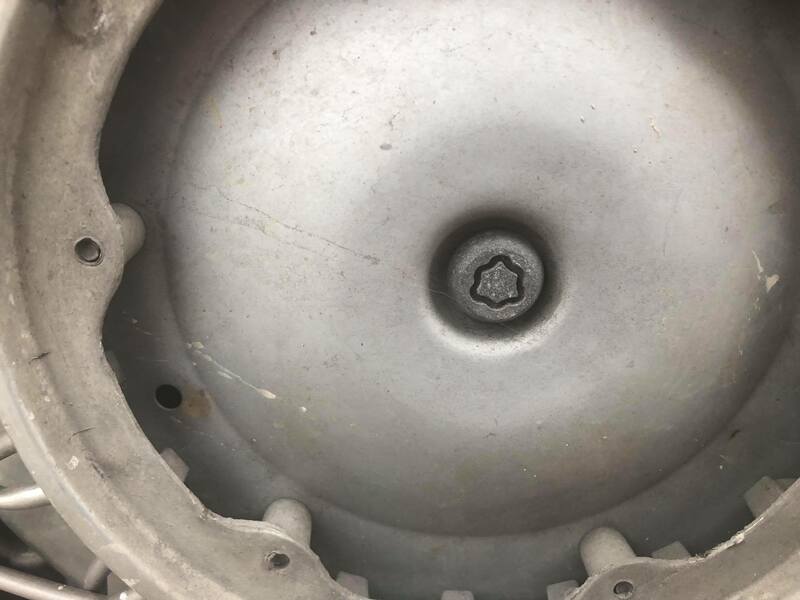 Not wanting to lose another hubcap, I'm wondering if anyone can take a look at this picture and tell me which wrench that I need to buy? Before you do anything else, look in every possible nook and cranny of the car for the wrench. There's no reason for a previous owner to take it with him, but that wouldn't necessarily stop a diligent but ignorant cleaner-outer from throwing it out along with all the pop cans and hamburger wrappers. It's worth the effort. You're not going to find a replacement very easily for a car that's 30 years old, but you are going to need something so you can get those tires off. Scouring junkyards might work but is probably unlikely. Your best bet may be to carefully re-shape the head of that bolt with a tiny grinder so you can remove it using a standard wrench, or possibly grind off the head of the bolt completely and replace it with a standard bolt. You might also want to search for classic Chrysler vehicle forums on the internet. Search for "Mopar" as well as "Chrysler". I've searched every spot I could think of in the car, with no luck. I know I can find the wrench on Ebay, I just need to know which one to look for to match the bolts on my car.